Advanced Diploma in Automotive Mechatronics (ADAM) is the largest initiative of its kind under the successful PPP model of Government’s ‘Skill India’ initiative, by any luxury car maker in India. 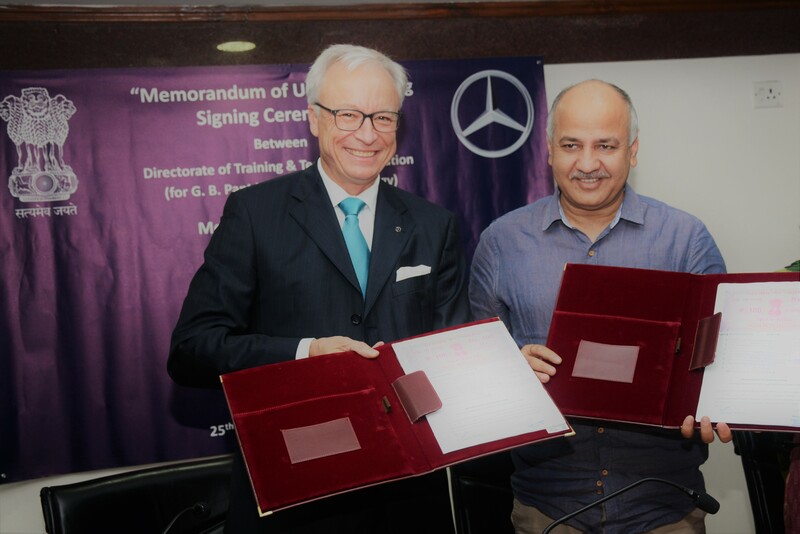 New Delhi: G. B. Pant Institute of Technology today signed a Memorandum of Understanding with Mercedes-Benz India to run the one-year Advance Diploma in Automotive Mechatronics (ADAM) with the aim to educate the Delhi youth with the latest technology and make them employable. Mechatronics initiative will prepare the youth with expertise in mechanical, electronics and informatics as well as in other modern automation technologies. Ms Punya Salila Srivastava, Secretary, Education, Shri Manoj Kumar, Director, Directorate of Training and Technical Education, Mr Santosh Iyer, Vice President, After Sales, Mercedes-Benz India and other dignitaries were also present on the occasion. The Mechatronics training school at Mercedes-Benz India was started in the year 2002 with the aim of providing trained service personnel and engineers. To address this requirement, the parent company Daimler AG, Germany along with Mercedes-Benz India and the Mercedes-Benz India dealership network joined hands to start the program and train students to address the requirements of Mercedes-Benz technology and innovation. Only 20 students per centre qualify to take the course every year. Since its inception, over 540 students have successfully completed the program and have been placed within various organizations in India. The Mercedes-Benz network is the largest among all luxury automotive manufacturers in India, spread over 42 cities and 86 outlets. The Mechatronics program also provides support to Mercedes-Benz India’s state-of-the-art operations at Chakan, Pune. G B Pant Institute of Technology, formerly known as G. B. Pant Polytechnic, was established in 1961. It is the largest Polytechnic in Asia, spread across 20.25 acres with over 600 students passing out every year. The institution started with three-year diploma courses in Electrical, Mechanical and Civil Engineering. Diploma courses in Automotive and Production Engineering were added later. They also have four-year part time diploma courses in Electrical, Mechanical and Civil Engineering to assist students who could not enroll in the full time course but were still motivated to upgrade their knowledge and skills. The ADAM course will be offered under the Automobile Discipline of the college. The initial plan is to start the course with a single batch of 20 students and the selection of candidates will be strictly as per merit via an Entrance Test conducted by the college under the supervision of Mercedes-Benz. Engineering Degree/Diploma holders are eligible to appear for the entrance test. Certificates for the successful students shall be jointly issued by the authorities of the college and the company. Mercedes-Benz India have already imparted training to the faculty members from GB pant for more than a year. Mercedes-Benz India, with the Mechatronics program, creates a firm knowledge base for aspiring engineers in society. It is a part of the core process to be inducted into the world of superior technology, innovation and passion. The process that Mercedes-Benz India has put in place will benefit not only the growing demand of the workforce for the company’s growth trajectory but also address the need of the industry as a whole.